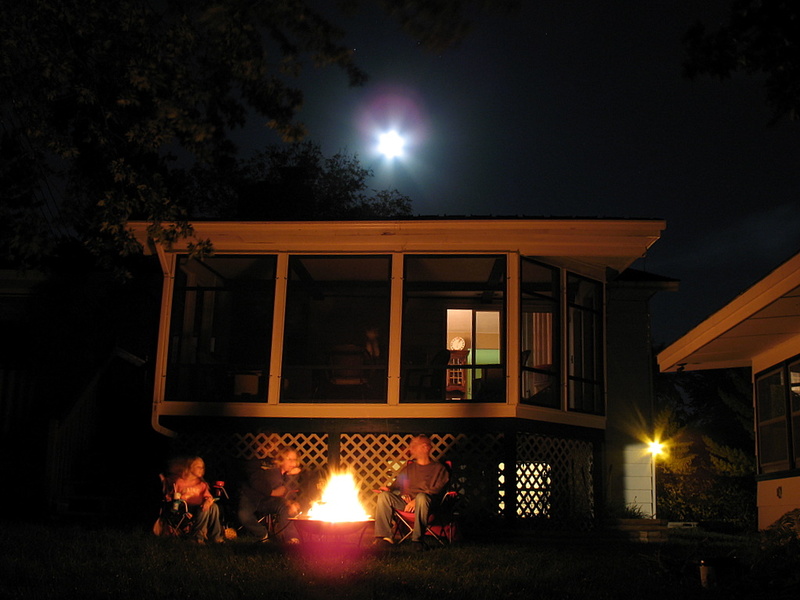 It was a cool Saturday evening, the moon was full, the fire ring was ablaze. It was a four second exposure for this crafty photo. 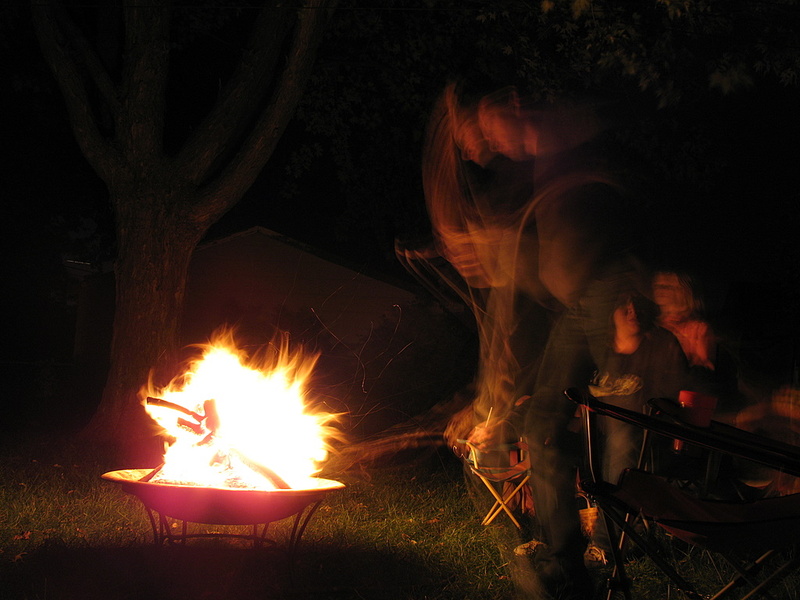 I was trying to stir up a bunch of embers into the air, but I'll settle for the movement in the photo instead. I took this photo just as the sun was about to set. The sky to the west was as pink as the sky could possibly be. 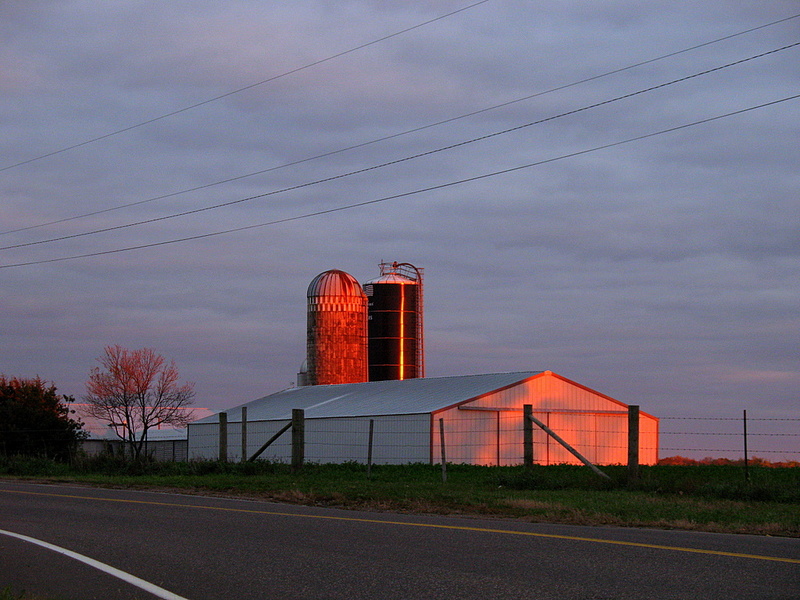 The pink suns reflection on this silo and barn was a site to see. Look at the sky in the photo, it was a very cloudy day up until the sun set. The clouds broke just enough to let the setting sun rays shine through. 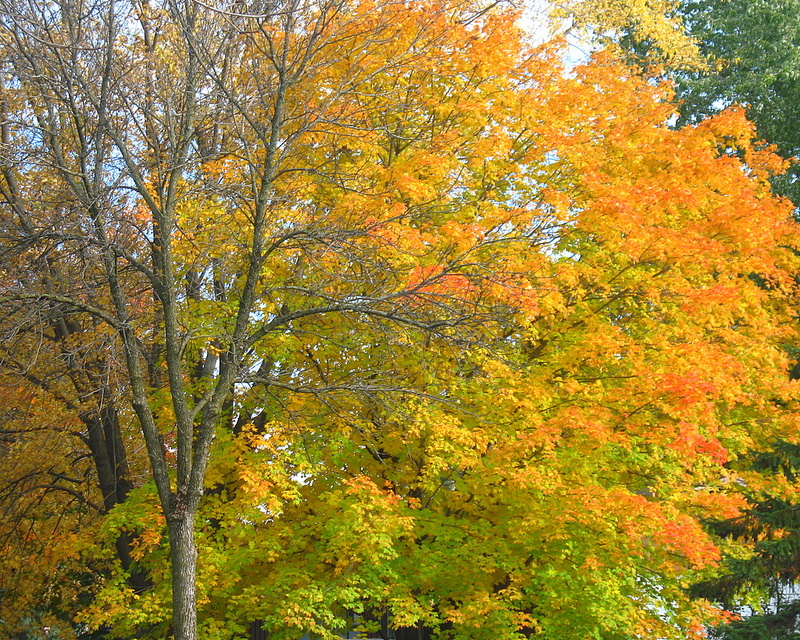 Yep, it's fall here, the leaves are changing fast. This photo was taken about a week ago. Since then, about half of the leaves have fallen off the tree and it's becoming more bare by the day. I think I hear my rake calling me. There is so much going on in this photo, the object I was shooting, is hardly visible. Do you see it, the rainbow? Right there as it trails into the advertisement billboard. Not yet? Perhaps if you click on the photo, you'll see that there really is a rainbow in this photo. 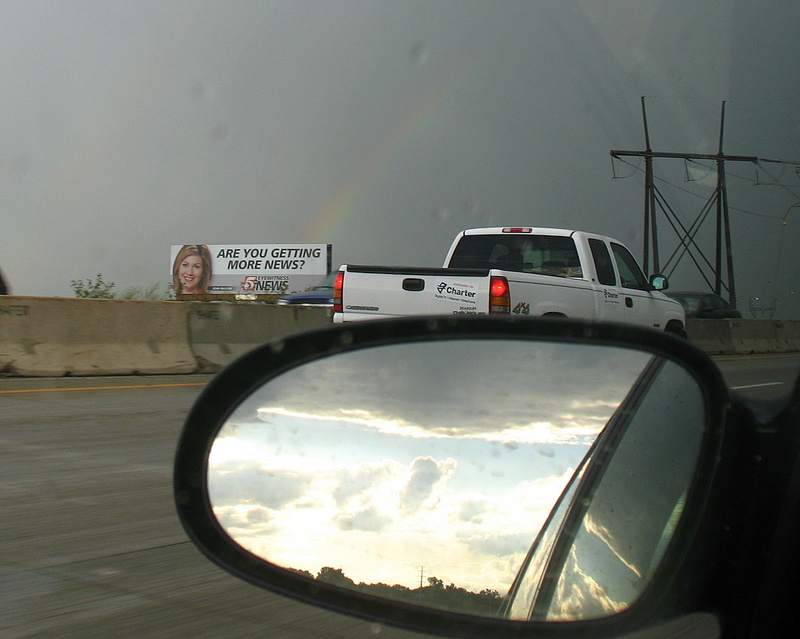 I really didn't like this photo at first, and I didn't capture the rainbow photo I wanted, but I'm posting it any ways because I really like the stormy direction I'm heading into, but with the side mirror view, you see the storm has passed, the weather is going to clear up any minute. I'm traveling east in my vehicle, stuck in traffic. The clear skys are to the west and soon to be where I am. 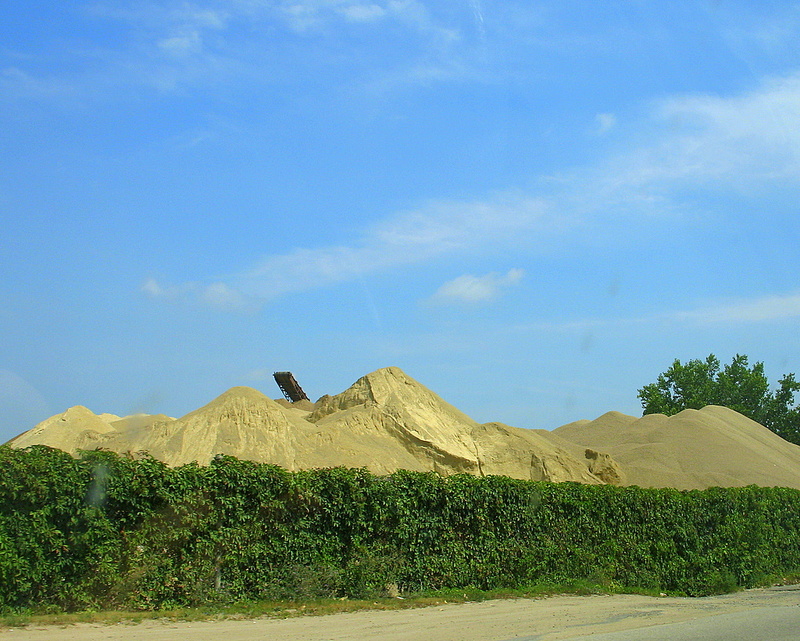 This large pile of sand can be found in Burnsville. There is a gravel and stone quarry facility on the banks of the Mississippi River, about where 35W and Highway 13 cross each other. It's been there for as long as I can recall. This huge pile of sand and gravel is prevalent throughout the acreage of land. Every year. 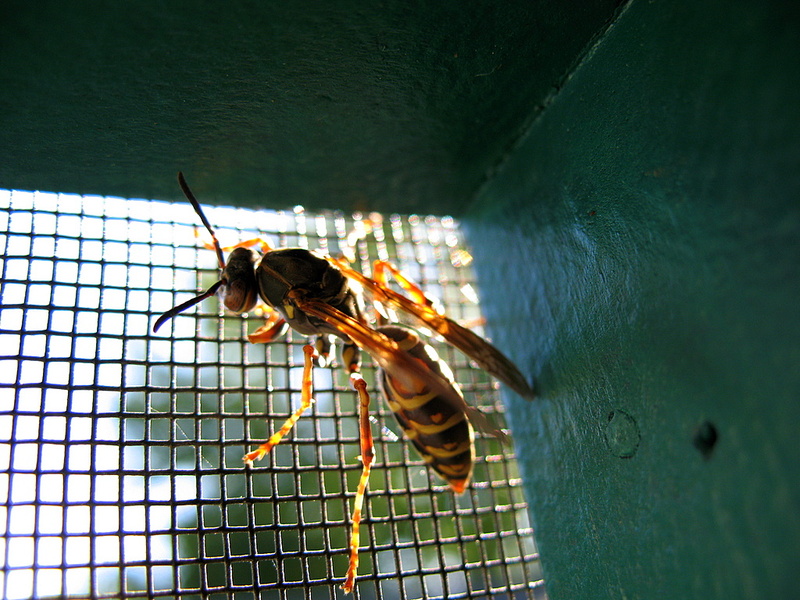 during the fall, the bees find a way into my three season porch. It's fully screened, with a roof and there also is screen under the floor. The entire summer months, we never get any misquotes, bees, ladybugs, you name it, they don't come onto the porch. Yet, during the fall, the bees and ladybugs manage to find their way in. They always collect on the sunny side of the porch which would be south. I captured this little guy as he was looking for a way out in this corner. 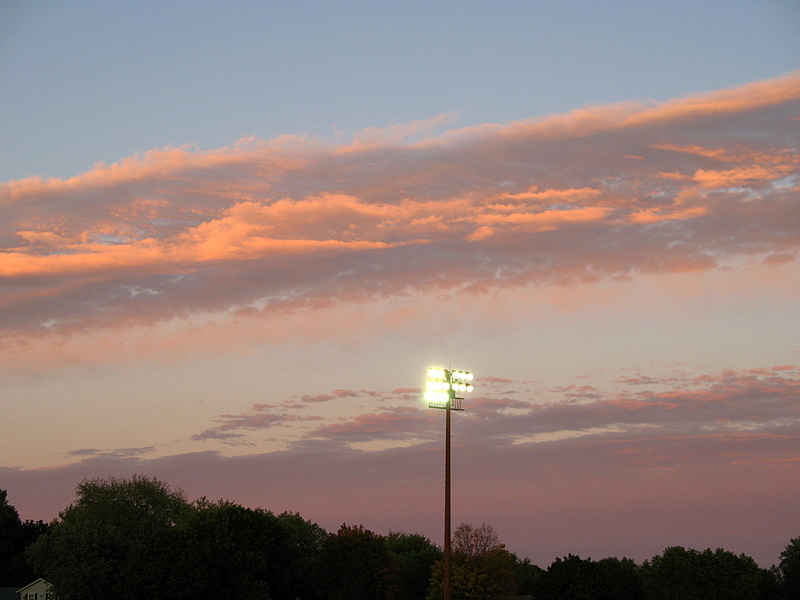 Photo I took of the clouds while I was attending the Park Wolfpack High School football game. The clouds were lit up very nicely with the setting sun. Shortly after this photo, the temperatures cooled with the absence of the sun. I really like this photo, the contrasting colors, the building detail. Mainly I like that the two roof lines of the buildings in the background have the exact same roof angle as the green roof does. Your thoughts? Zurich, Switzerland - a must see! Just before I posted today's photo taken near the farmers market in downtown St Paul, something stood out to me that hadn't occurred to me when I took the photo, nor when I processed it for adding to the site today. 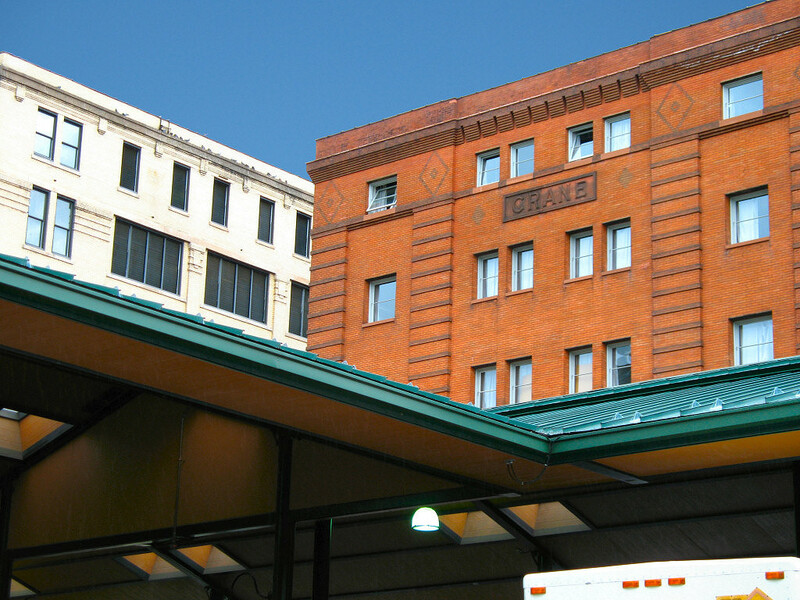 The front of the brick building is complete newer than the rear portion of the building. Which then brings to question, was the front of the building was refaced with the newer brick, or was it a completely new addition to the building? The brick color obviously doesn't even come close to a match. Though he is very well known in Minnesota, ShortArmGuy, also a fellow co-worker, was selected to get filmed for the The Learning Chanel's reality show, Miami Ink. Out of the thousands or so of applications they receive on a weekly basis, ShortArmGuy was selected to have a tattoo inked at the famous Miami Ink Tattoo Parlor. While there is no guarantee that his footage will make it on air, if it does however, it wont appear until sometime in 2008. I will certainly provide updates when warranted. ShortArmGuy was tattooed by one of the best in the business, Chris Garver. He helped design the final design of the tattoo. A bit of information about the tattoo design, the storm represents the challenges him and his family have been through. The hand is him and his family. The sunny sky represents hope for the future. I can honestly say, that pretty much sums up what I know about ShortArmGuy and his family. Despite the hard, tough challenges they have been through, they always stay positive and believe that everything will work out in the end. Found this fabulous signature on the side of an electrical box while at the Farmers Market in downtown St Paul. 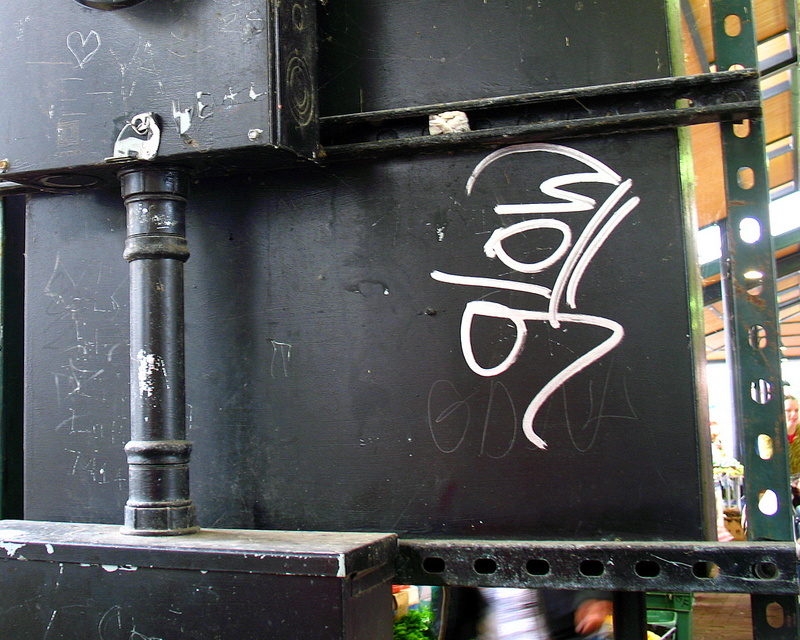 I'm not sure who 'glow' is, but their handiwork is now displayed on the Twin Cities Daily Photo. You may have your Six Flags, your Bush Gardens and your Disney Lands, up here in Minnesota we have Valleyfair for our largest outdoor theme park. This is an outside shot as you enter the facility. 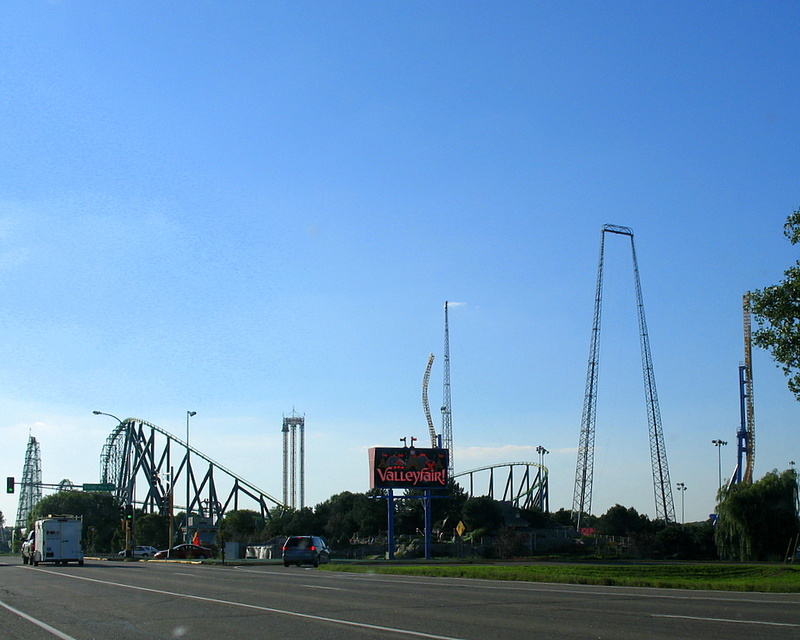 In the background are a couple of the roller coasters and similar rides that you can ride on. Or green with envy of this fabulous looking dinosaur that WAS on display up until about two weeks ago. The day I took this photo was the first time I had seen any of these dinosaurs scattered around St Paul. I'm not sure how many in all, but there was more than just this one. Three days later, I made a return visit to the very same sidewalk that this green giant was on display with about twelve other creatively painted dinos. History had repeated itself and all of the dinosaurs had vanished! Gasp! I'm blaming global warming on this recent dino extinction. Took this one a couple weekends ago during a family night bonfire. I had to wait a couple of hours for the moon to be high enough over the roof of my home in order to get it into this shot. I did an exposure time of 15 seconds, f/5. My one question to you is, do you see the cat in the photo? Another fun view of the Farmers Market in Downtown St Paul. I've been TAGGED by Rambling Round of Selma, Alabama this past lazy Sunday. I've been asked to list eight random things about myself that you do not know and in turn, tag eight others to do the same. 1. I've been out of the United States only two times. Both times to visit the country of Jamaica. 2. I will be traveling to Irving, Texas very soon. 3. I watch the TV show 'Survivor' with my wife and kids. 5. I have been married for 13 years and loving everyday of it. 6. I work in the computer field. 7. My first car was a 1976 Mercury Cougar. 8. I like to dance with my wife. 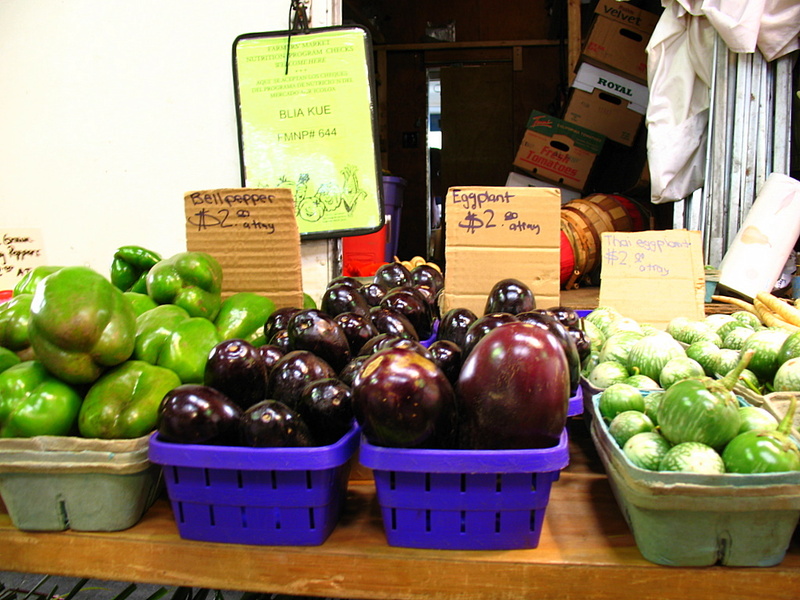 The other weekend we made a trip to the Farmers Market located in downtown St Paul. It was semi rainy day and couldn't do much photo taking. I had to limit the photos to under the shelter of the rain. 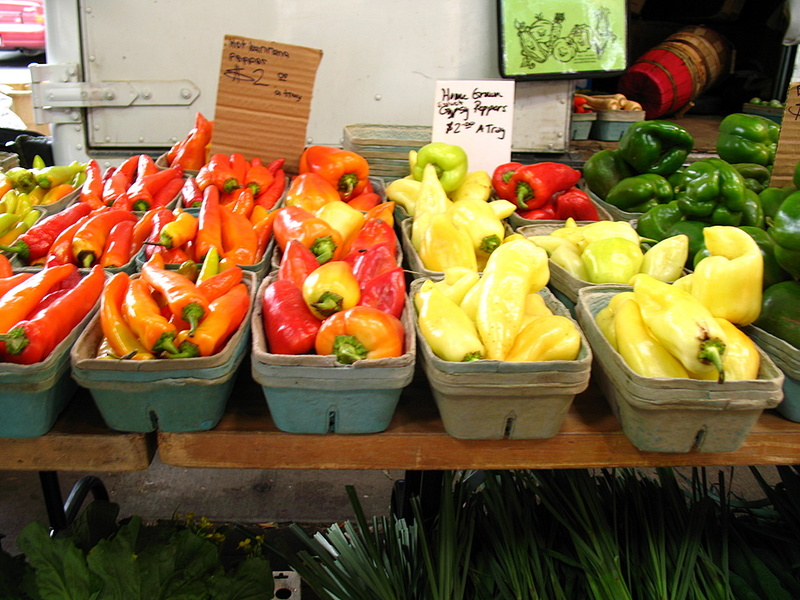 Though we didn't purchase any of the peppers, the colors stood out for this photo. We did however buy some broccoli. My goodness it was delicious! I'd never tasted broccoli that tasted this good in my life, EVER! I'm not sure if it was a different kind of broccoli or that it was frozen, or bundled and sitting on a shelf in a grocery store. We'll be making another trip back just for some more broccoli. If you read yesterday's comments, I was asked to give 8 random facts about myself from 'rambling round' of Selma, Alabama. I will honor this, but you'll have to wait until tomorrow evening as it's getting late tonight. On August 1st, the City Daily Photo community had a typical breakfast theme day. I elected to post a photo of one of my cats drinking coffee out of my cup. 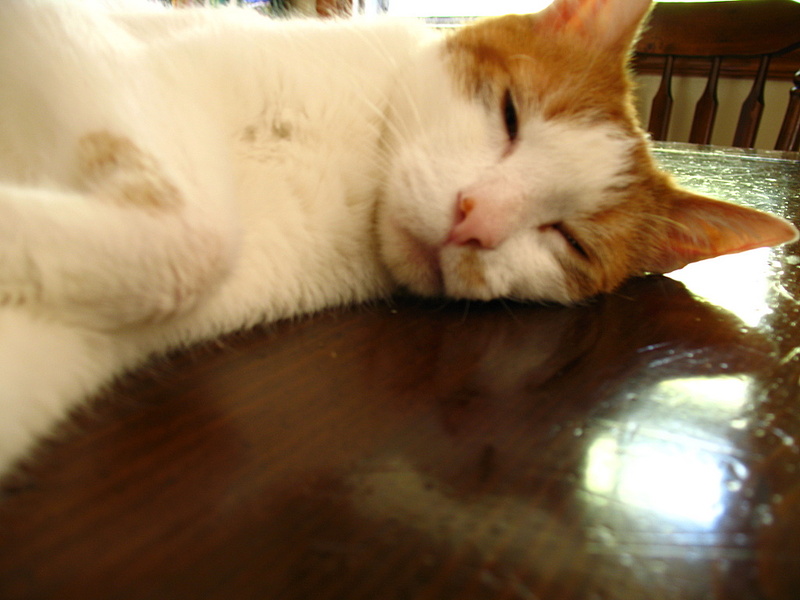 Today I'm expanding on that theme and showing a typical lazy Sunday, again of my cat. Being as today is Sunday, it's very appropriate to show a follow up photo isn't it? From the same street location as yesterday's photo. This one take a couple days later just as a passing rain shower had pass through. 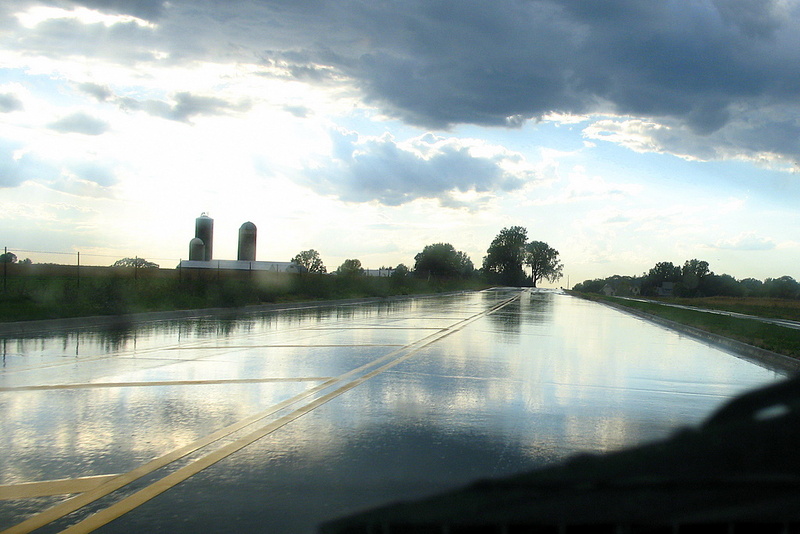 I took this one a bit further back on the newly paved section of the road as it gave a great reflective shot. You can see the same tree from yesterday's view at the end of the visible part of the road. My normal exit I would take to get to my home was closed for about five weeks for some road construction. This brought about a bit of a delay while taking the detour. It did however bring me to different parts of Cottage Grove and a few new ideas for photos. 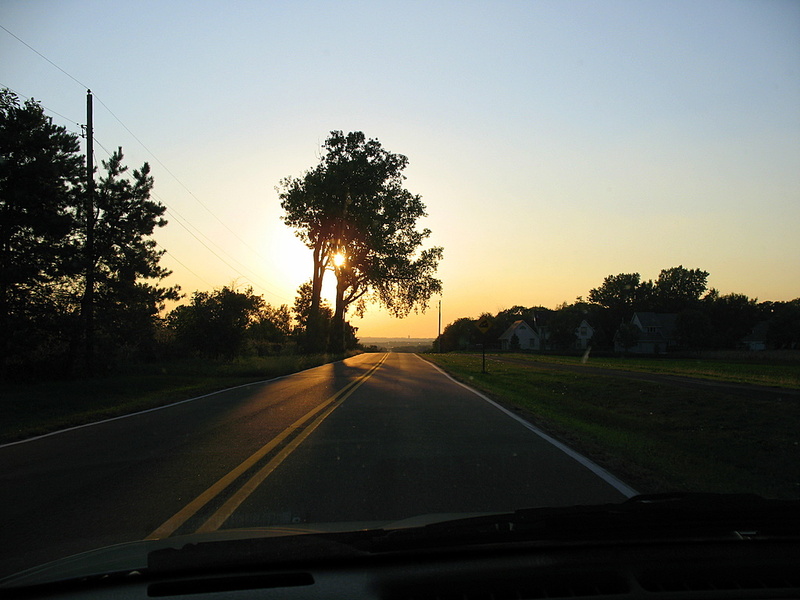 I'd been taking this road for a couple weeks, the sun sets a bit later each day as the fall season approaches. I hit this day a bit later than normal and the sun was just at the right spot, I thought with the sun behind the trees, it could make for a nice photo. I'm happy with the results. I must say, there is a glimpse of the view from the top of the hill in this photo. There is a lot to see, but it's very tough to get a clear visible shot. I'm going to take a few photos from the top of the hill one of these days, but I honestly believe for a grand view, I'd have to do a little bit of trespassing to get the shot I want. There is farm land on one side and homes on the other, not leaving much for photographers. It was a proud moment for me and wifey a couple Friday's ago. 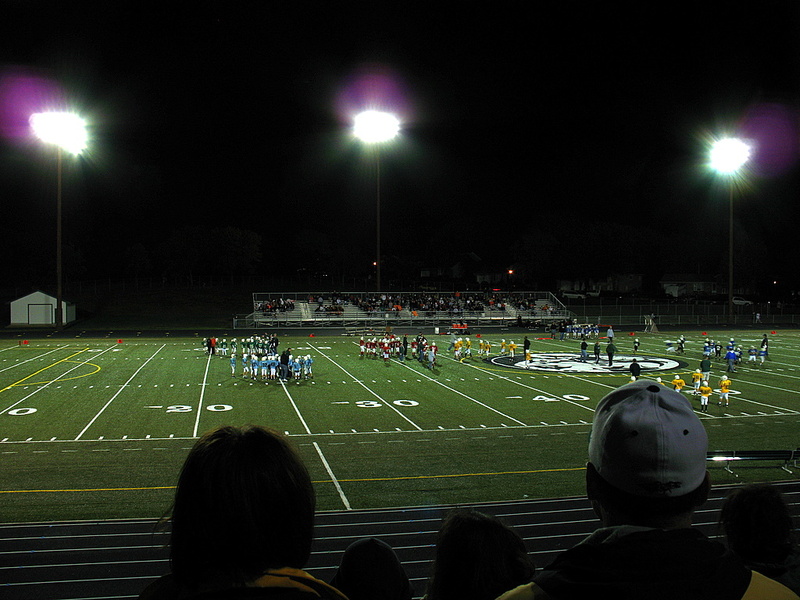 As part of the half-time entertainment, my son and his football team showed their talent and skills on the field for the Park of Cottage Grove high school football game. 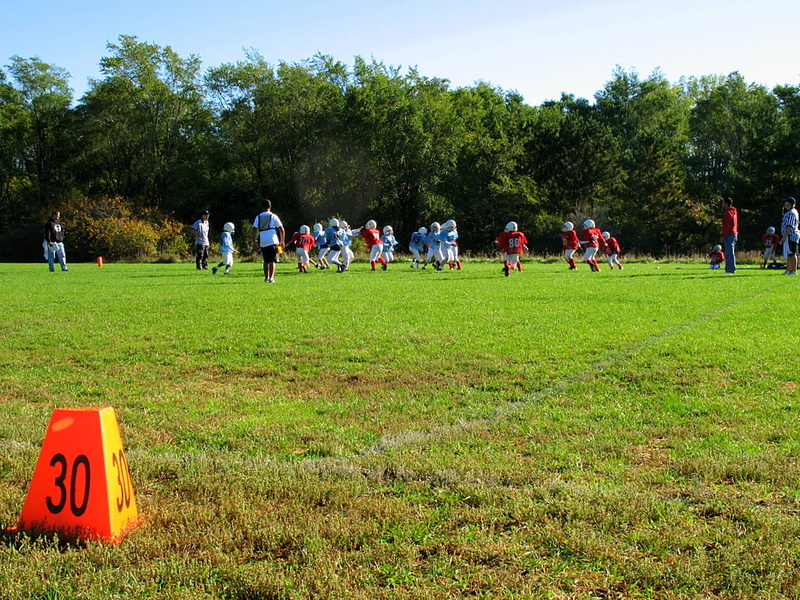 He was so thrilled to be out there on the real football field. The squad did very well considering the hundreds of people watching them perform. My son is in the Wee Pee division which is for 3rd and 4th graders only. If you are wondering which one is my son, he is in the red uniform, on the front offensive line. 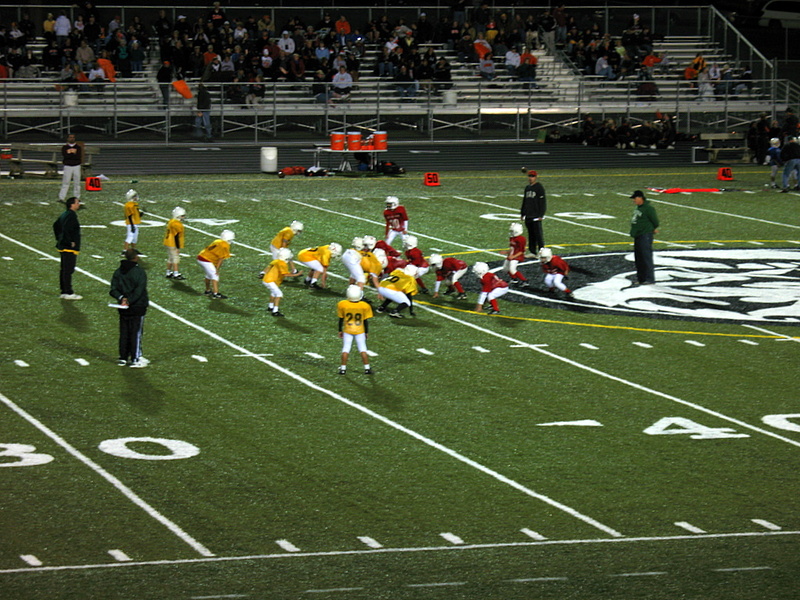 His left foot and left hand are touching the yellow circle painted on the turf. He is the only one visible that is touching the yellow line. 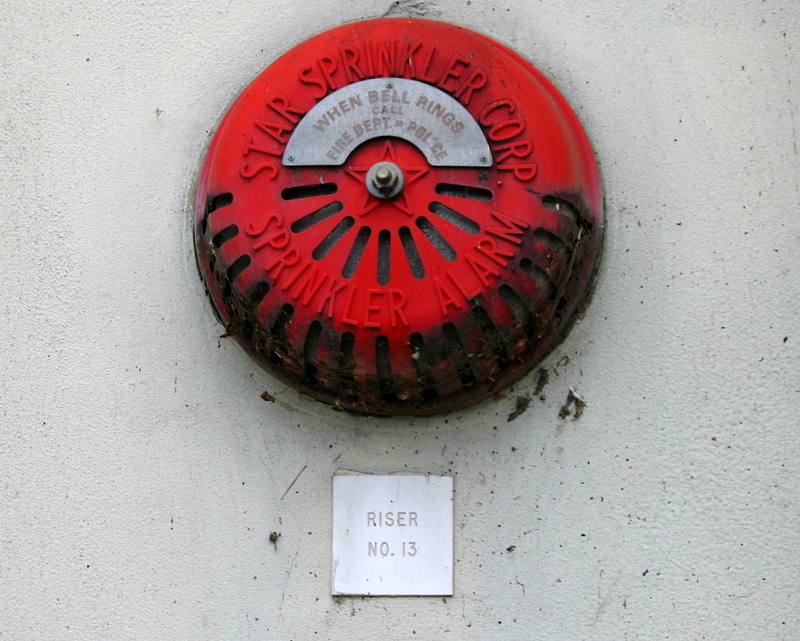 I like this, the Star Sprinkler Corporation and they worked in a star as part of their alarm design. 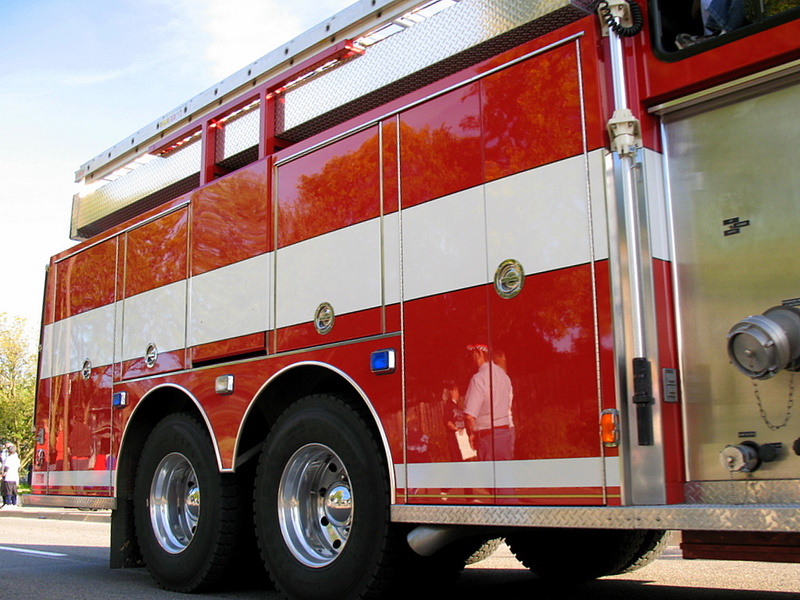 It's the details that make a fire alarm work. 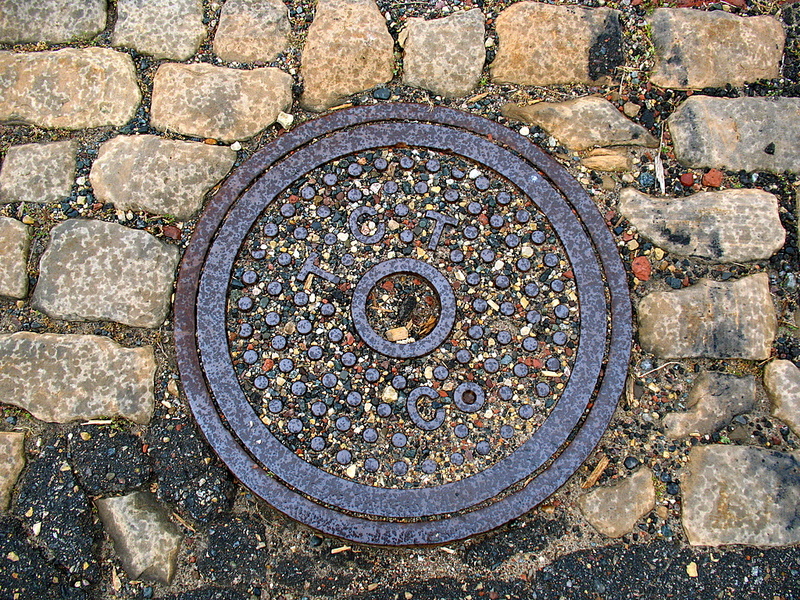 If you are lucky enough to find the exact manhole cover featured in yesterday's photo, turn around and you'll see this fire alarm as well. The other night I was driving to the grocery store to pick up something that was needed at the time. During my journey, I spotted the moon just as it was setting into the horizon. Time was against me as it was nearly out of sight as you can see. I had to find a visible open space, which was proving to be quite difficult that evening. 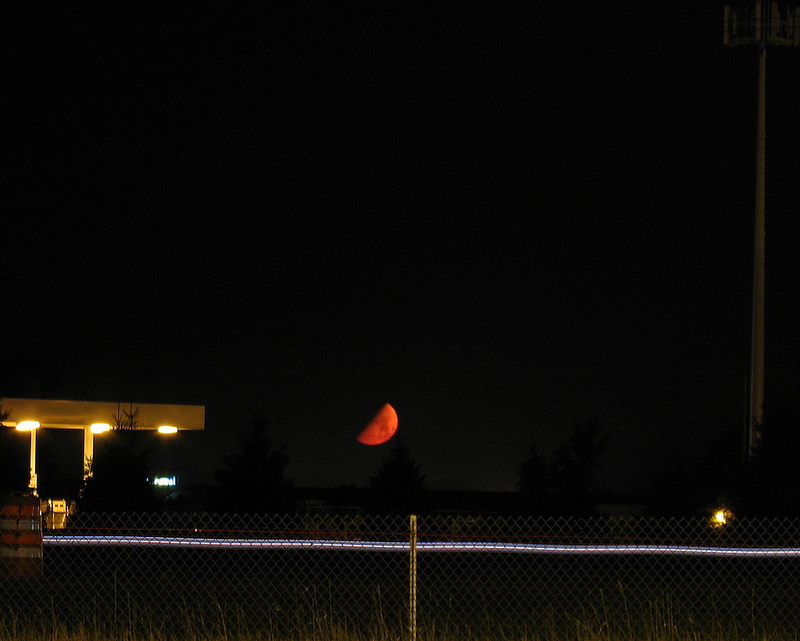 I did have my camera with me, but no tripod at the time. I used the top of my vehicle to capture this shot of our moon. It wasn't the most ideal location, I had never taken a photo like this before, but I'm fairly happy with the outcome. The white stream of light in the fence is a passing car on highway 61. Thursday marked the open night of Hockey for the Minnesota Wild. Tonights match up was from the Windy City, Chicago Blackhawks. 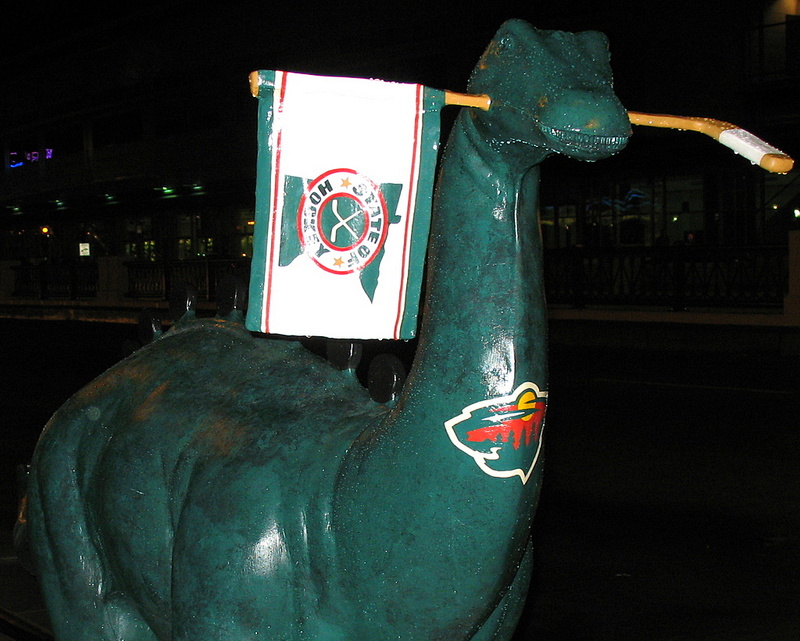 The Wild were victorious with a 1-0 score. This photo was from this past Saturday's pre-season game. 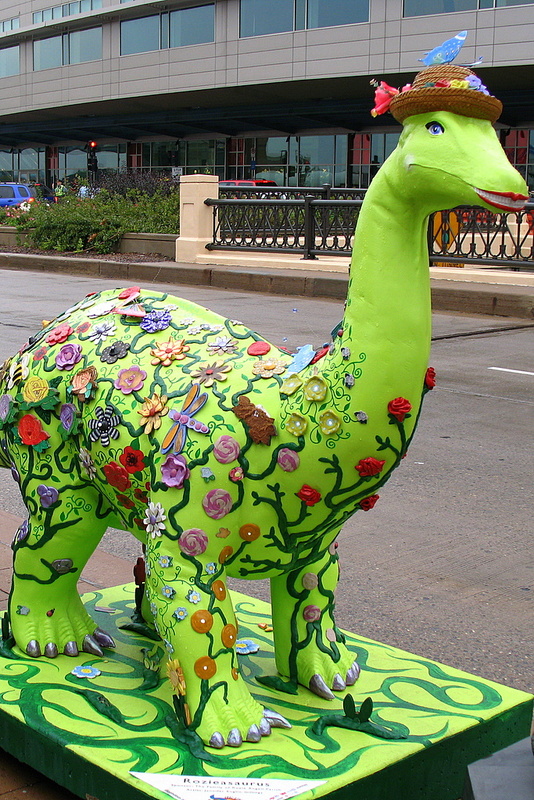 Outside of the Minnesota Science Museum, there sits about a dozen painted dinosaurs. All painted with a different theme. I've seen photos posted of the dino's on the other local photo blogs [St Paul - Kate, St Paul - Kate, St Paul - Carol], but until last Saturday, I had never seen any in person. 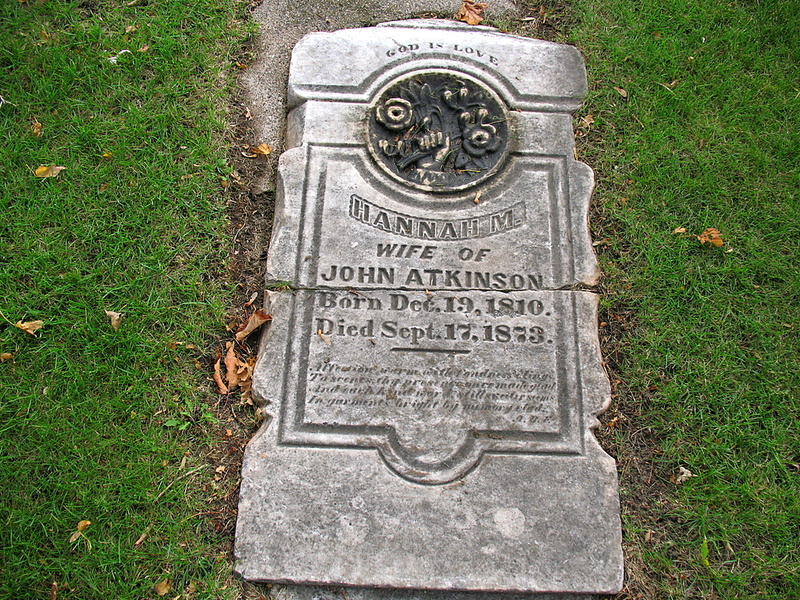 Hanna M. Atkinson was the wife of John Atkinson. Hanna was a wife of a farmer, which was a very common practice in the rich fields of Cottage Grove. She was born in Maine on December 19, 1810. John and Hanna were pioneers of the time and settled in Cottage Grove in 1846. Hanna passed from cancer at the age of 64 in 1873. The exact date and month conflict of her actual death. As you can see, the gravestone sites September 17, 1873. Two registers of death list October 11 or October 12. One note of interest on the tombstone. Bwide of Riverfalls, Wisconsin, which is about less than 50 miles from my location. He posted a tombstone photo for the October Theme Day. I see a huge similarity between the two stones. The shape, font, similar layout, size and the age of the stone all look too coincidental. Is it possible that the make of Hanna's gravestone, and many others in Atkinson Cemetery, are the same tombstone make for the one posted at the River Falls Cemetery? Take a look at the photo and see for yourself. If you look closely in the background of today's photo of the historic plaque for Atkinson Cemetery, you'll see highway 61. 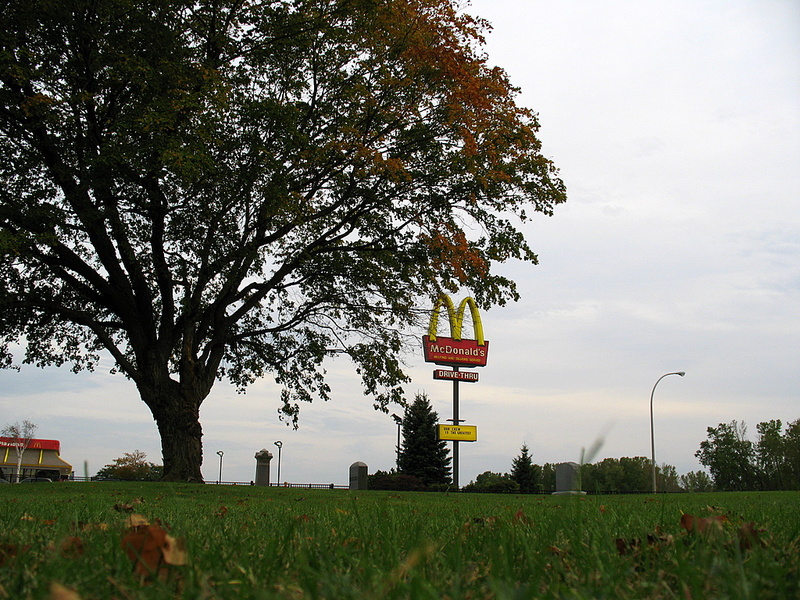 To the left, is the McDonald's, the right is a Tires Plus and directly behind where I stand for the photo is a frontage road. Despite the city sprawl, despite the cemetery being abandon for nearly 60 years, despite many early cemeteries being relocated, this historic plot of land is one of the oldest cemeteries in Minnesota that is still in it's original location. 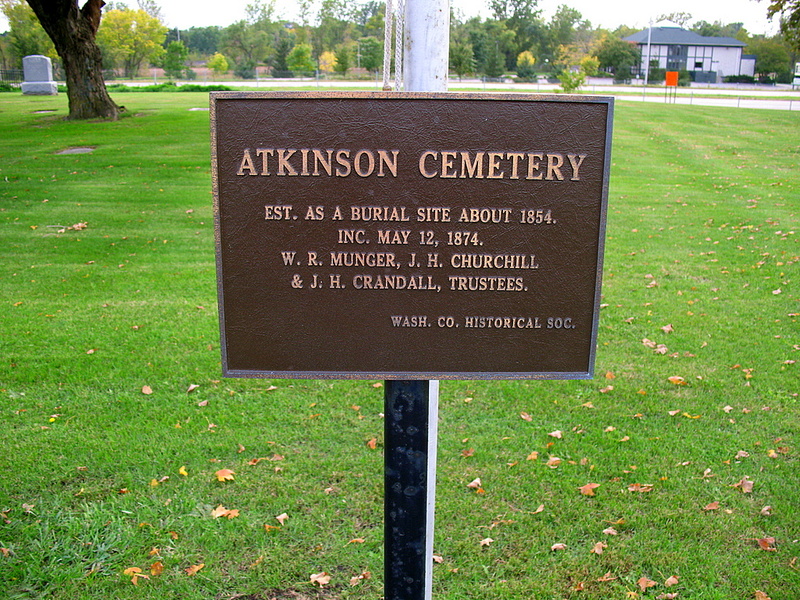 The Atkinson Cemetery came to be in 1854 when John Atkinson and his wife Hanna, lost their son Martin at age 16 and a half years old on July 4, 1854, he drowned. They buried their son on a parcel of land they owned, this eventually became Atkinson Cemetery. Some of the historical information has been lost over the years. There are a few tombstones that have no record of a body being buried and perhaps they are just a tribute to loved ones. There are oral records from family descendants that claim there are burials there for which no stone exist. Since there are no formal records for the cemetery, there is no way to verify the verbal information. From: E. Katie Holm "The Cemetery Association appears to be inactive by the early 1900s, and, despite the tiny cemetery's significance, it fell into disuse after the burial of Alzina (Munger) Austin in 1909. With no one to care for it, and taxes due to the city, Atkinson became an abandoned cemetery. Eventually the cemetery became overgrown with lilacs and sumac, and fell prey to vandalism. In 1970 Elizabeth and John Erickson, a couple who took on the immense task of transcribing all of Washington County's cemeteries, visited Atkinson and found it in a terrible state. One of the Ericksons noted: "It has not escaped the attention of vandals, who have left standing only three stones, two of which were apparently too massive to topple and one of which was hidden behind a clump of lilacs….this cemetery is virtually unrecognizable as such from the roads on each side of it." 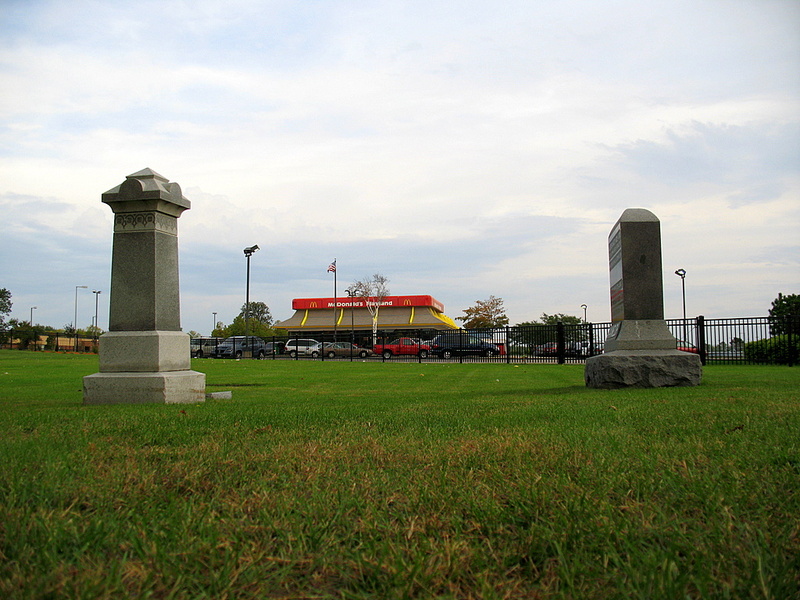 In 1974 the McDonald's franchise built a restaurant on the land just south of the cemetery. Apparently the cemetery was so overgrown no one even noticed it was there. By 1979 the cemetery was in such a bad state that the county handed it over to the City of Cottage Grove. The City, along with the local Lion's Club, performed a major overhaul on the cemetery. Toppled stones were removed for repair and restoration, and most of the vegetation, save one lone oak tree, was removed. The ground also had to be leveled since it was so pockmarked by gopher holes. The grave markers were then replaced, but due to the effects of vandalism and lack of cemetery records, no one is certain if the stones were returned to their original places." 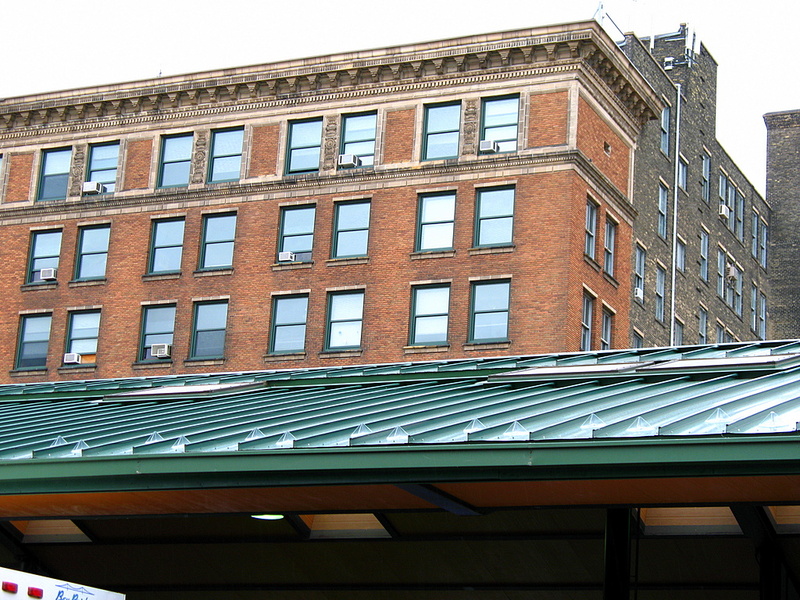 Whom Is The Famous Person Buried In Cottage Grove? 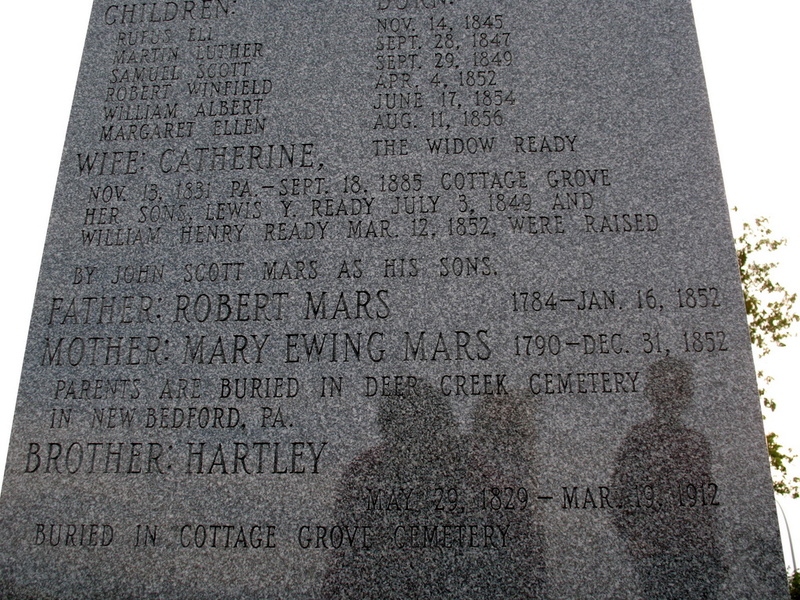 In a very small plot of land, approximately 150 feet by 300 feet in size, in the early 1980's, in Atkinson Cemetery, Cottage Grove, a monument to the Mars family was erected. Franklin C. Mars, founder of the Mars Candy Corporation [Mars candy bars] is believed to have been buried there. There is a bit of controversy here, when the monument was put in place, a few local newspapers claimed that the founder of Mars Candy was buried here. Though it is believed he was really buried in Lakewood Cemetery in Minneapolis. 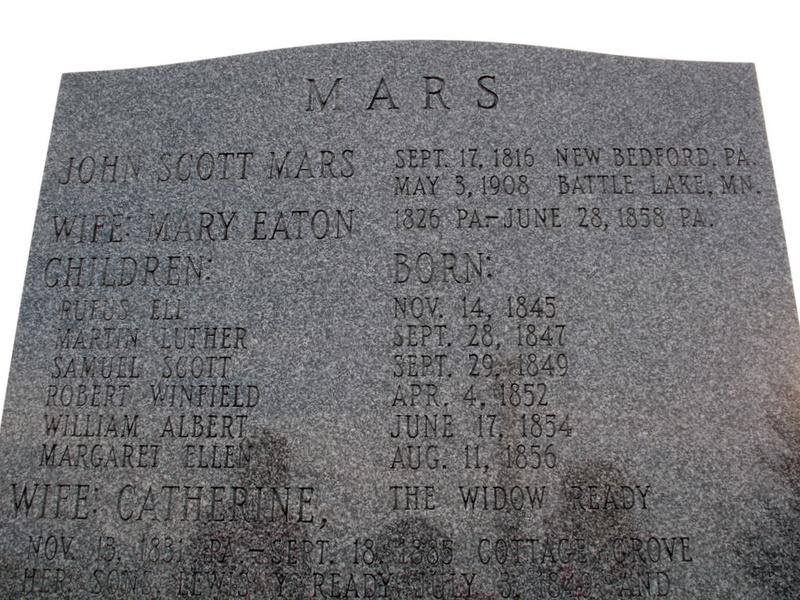 Evidence of any Mars family members being buried here is not real clear, however according to an undated Platt Map of Atkinson Cemetery, a plot of land was sold to John M. Mars. There are no surviving gravestones containing the name Mars, and many of the Marses listed on the monument are buried in Cottage Grove Cemetery [which I will be paying a visit too shortly]. The Mars family was a very large and prominent family in Cottage Grove and helped shape the community in it's early years. Tomorrow I'll give additional historic details on the Atkinson Cemetery and a bit more of what is located around it, how it came to be, etc. The Mars grave photos were very tough to photograph, the dark face with the engraved text, if it wasn't at a certain angle, you couldn't read it, thus I split the photo into two sections so the lighting was good for reading. I have waited a long time for this theme day of cemeteries and tombstones. There was a suggestion of this about a year ago and this shot has been in my mind ever since. I'll be curious if there are any other cemetery photos as surprising as this one is. 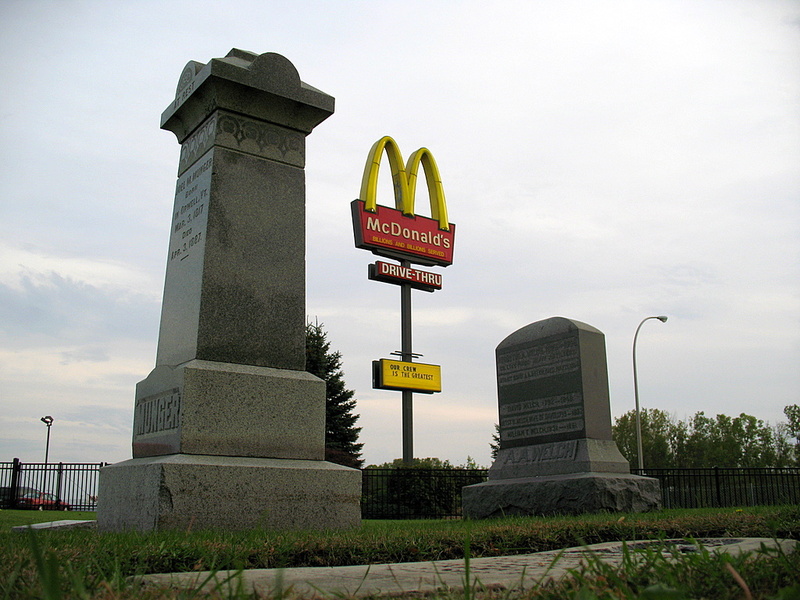 How many cemeteries have a fast food restaurant right next time them and an auto garage on the other side of the plot of land. One could also see this photo as one hell of a subliminal message! This cemetery does have quite a history in the city of Cottage Grove, including a celebrity that invented something you are probably familiar with. Come back tomorrow and I'll give full details then, it will be worth it. In the mean time, visit the other cities participating in the October Daily Photo theme day, the links are below this photo. See you tomorrow!